We work to eliminate our dependence on fossil fuels and reverse the worst impacts of climate change. In 2008, we helped to pass the Global Warming Solutions Act in MA which helped us set goals to reduce our carbon emissions which we’re on track to hit. Now we’re asking our college campuses and communities to commit to getting 100% of their energy from clean, renewable sources. 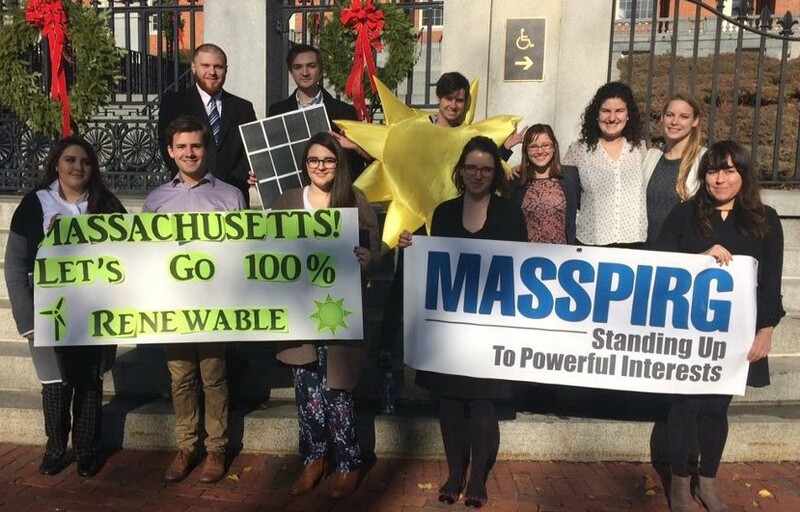 Our chapter at Salem State successfully passed a resolution through the city council, making Salem the first city in MA to commit to 100% renewable energy. Now, we’re working on 20 campuses across MA to get similar commitments from our campus leadership and support statewide legislation that will do the same. We’re working to protect the environment by reducing wasteful single-use products in our communities. 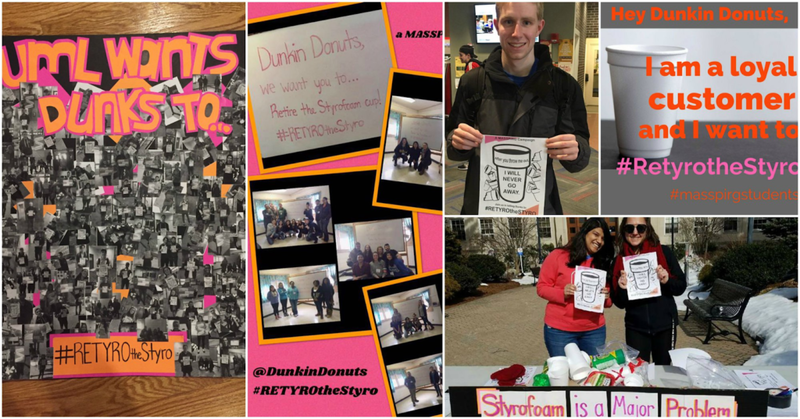 Recently, student leaders at UML launched a project asking Dunkin’ Donuts to retire their foam cups by demonstrating customer support on social media and through phone calls into the headquarters. We ran this campaign on multiple campuses and took statewide action asking the company to live up to their sustainability commitment. In Feb 2018, Dunkin’ announced they’ll phase out their cup by 2020 – effectively eliminating 1 billion cups from our communities. We work to protect public health by stopping the overuse of antibiotics on factory farms. In the US, 90% of all our life-saving antibiotics are sold to factory farms and given to animals that aren’t even sick. 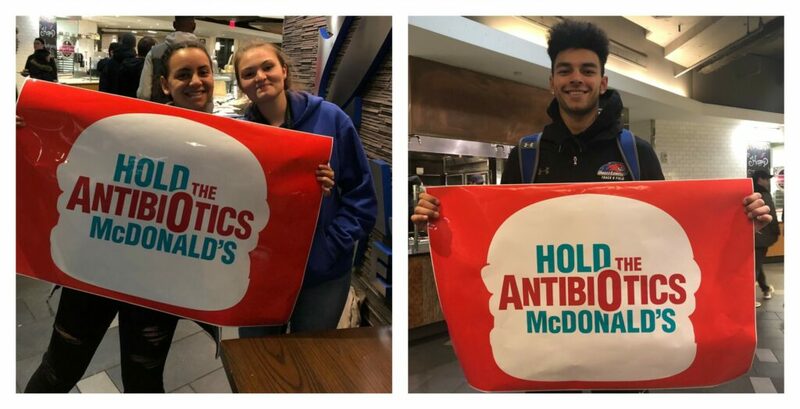 We mobilized people to call on fast food restaurants to stop buying meat raised on the routine use of antibiotics and successfully got McDonald’s, Subway, and KFC to make this commitment with their chicken. After 2 years of working on this campaign, we were able to shift the marketplace so that over 50% of all chicken sold will be free of routine-antibiotic use. A huge victory for public health. We work to mobilize the youth vote during elections. 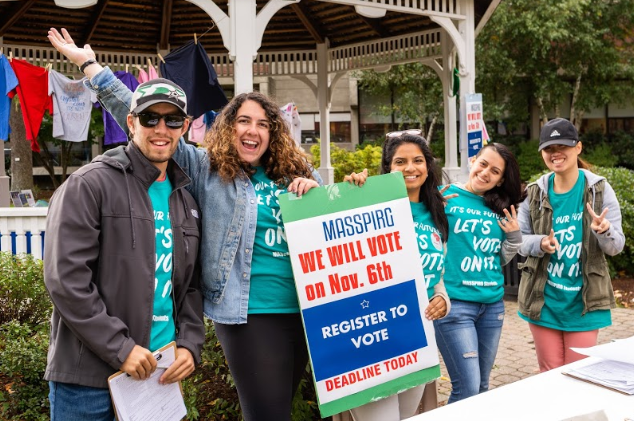 In the last 6 years, MASSPIRG has helped to register over 28,000 students to vote. In the most recent midterm elections of 2018, we helped over 3,500 students get registered to vote and saw a 55% – 85% increase in turnout since the 2014 midterm elections at the student-heavy polling locations.